Perception is reality. In company after company it does not matter what the company reports at this time, even if it's a "beat and raise" - the perception is those numbers that were beat are the "past" and no longer pertinent, and the guidance offered in the future won't happen either. The former point always amuses me because why do we bother to report earnings at all if they are going to be immediately ignored in lieu of "future guidance"? We spent 90 days fretting over a number, and within seconds we say "who cares, tell me about the future!" And the latter factor (ignoring future guidance) is simply afflicting almost every company. 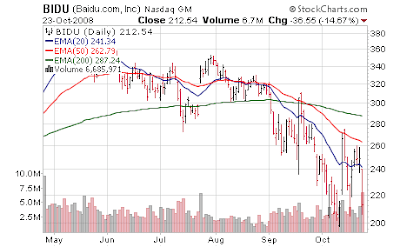 I'm reading through many earnings reports, but want to highlight a few names we don't currently own and Baidu.com (BIDU) is one of those high growth stories that should last for years. (albeit nothing can grow 100% year over year forever, it WILL slow) But, this has been a large hedge fund holding and right now it is dangerous to hold anything "they" hold en masse. But we're keeping this name on the radar. The stock was crunched 15% yesterday on fears of Chinese advertising slowdown, despite stellar earnings. Julian Robertson is a recent buyer and this is the cheapest I've ever seen Bai... ah, nevermind. Chinese Internet search leader Baidu Inc (BIDU) posted a 91 percent rise in quarterly net profit, after a surge in Web usage tied to the Beijing Olympics, and said it expects continued strong revenue growth. Baidu's shares have fallen by about a third over the past five months, in line with general weakness in global markets, raising the possibility the company could be considering a share buyback with its some $340 million cash stockpile. "We do want to definitely put the cash into the best use," Jennifer Li, the company's chief financial officer, said during a teleconference with analysts. But the company did not have any plans to do so, she added. Net income rose to $51.2 million in the third quarter from $24.2 million from a year earlier. Net profit per share was $1.47, beating the $1.27 per share forecast by Reuters Estimates. Baidu's revenue increased 85 percent to 919.1 million yuan from a year earlier, largely in line with analysts' forecasts. For the fourth quarter, the company said it expects total revenue ranging from $151 million to $155 million, which would represent growth of 80-85 percent growth over a year ago. Citi Investment Research analyst Jason Brueschke expects a strong finish to the year for the Beijing-based company. He rates the stock "Buy." "Baidu (revenues) are wholly domestic and derived from an extremely broad customer base, offering investors a highly diversified and hence less risky (revenue) stream," he wrote in a note to investors. That said, he added Baidu is a pure advertising company, and its revenue is correlated with the health of the underlying Chinese economy -- which is slowing.